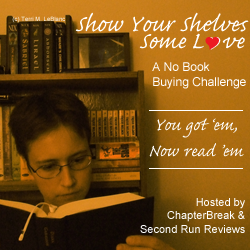 The Show Your Shelves Some Love challenge is sort of like the various TBR reading challenges, but with the focus on not buying books rather than just on reading your TBR books. Since my TBR pile continues to grow (though I've slowed the growth a little! ), this challenge could be just what I need. Now, I'm not ready to commit to buying no books for a year. But I am going to set a budget (that's February's monthly topic for this challenge) and stick to it, while focusing on reading the books I already own. To start with, I'm going for the second level of this challenge: blue belt, requiring 11-20 TBR books read. Books will be listed below as I read them, and linked to reviews as I write them. Thanks for joining the challenge :) Setting a budget is a great option - anything helps, right? Can't wait to hear about your budget next month! Glad to have you on board. Good Luck and thanks for joining our #Shelflove Challenge!! !